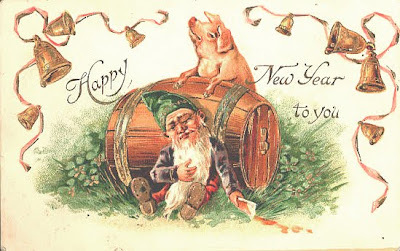 Check out these vintage 1930s-40s gnome New Years cards I saw on eBay. Hilarious! I've been interested in prehistoric models for a while now. 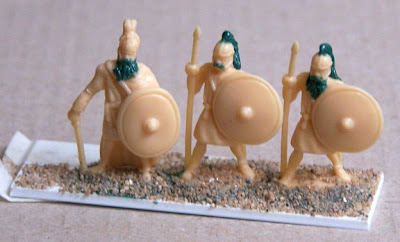 I was glad tp see the new production of 28mm scale metal prehistorics from Dazed Miniatures Unfortunately, it looks like they are no longer being produced. 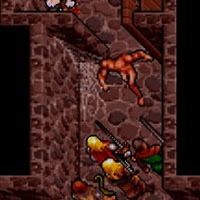 RLBPS is only selling off the old stock, so get them while you can. 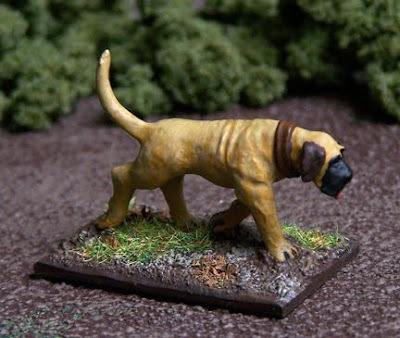 My only prehistoric models are a few sets from Pulp Figures and some very old school mammals. Marx Toys produced some plastic prehistoric playset in the 1960s. You may have seen my painted Mammoth in an older post. 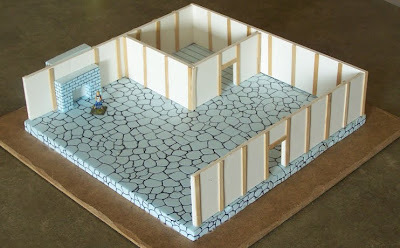 That model was recast plastic from the old molds. This giant sloth is an original. I got them both from the Toy Soldier HQ. I was a little hesitant to paint a30 year old toy, but the plastic was kind of sticky, and I figure there's no sense in having it if I'm not going to actually use it for anything. 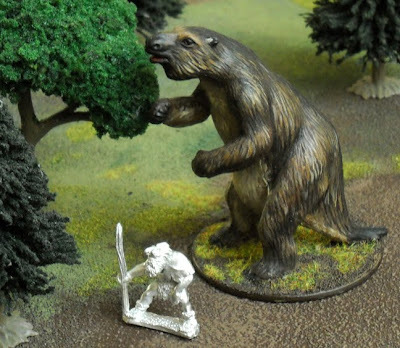 As with the mammoth, this megatherium model is glued to a plastic 60mm base. 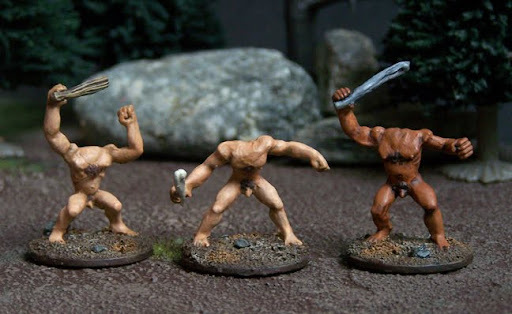 A 28mm Pulp Figures neanderthal is included for scale. The neanderthals, short faced bear, and saber tooth cats are hoping I'll paint them soon. 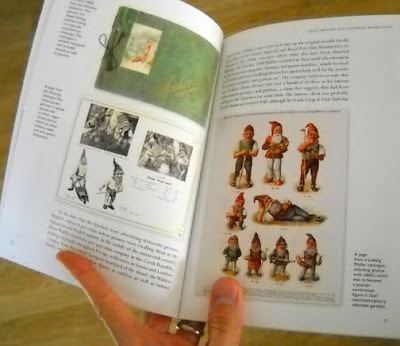 Published in June, 2009, Garden Gnomes: A History by Twigs Way is another of Shire's nicely designed books. A historian of gardening, the author tells the story of these European garden accents. 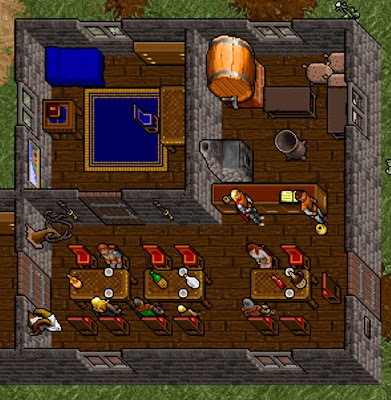 She explores their origins (beliefs of dwarfs, nisser, and tomtar), studies the craft of their production, and charts their rise and fall in popularity. The text is illustrated with pages from period catalogs and photographs of gnomes in gardens throughout history. 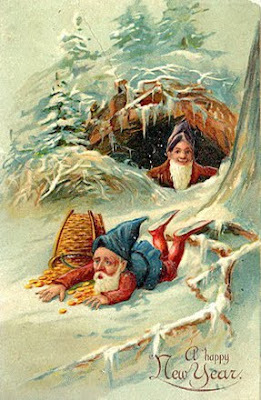 The book ends with a view of garden gnomes' affect on modern pop culture, with a mention of the trend in gnome liberation (stealing and relocating the ornaments as a prank). My family's past is dotted with appearances by garden gnomes. There are currently three or four in my mother's garden. These were made by a family friend in the 1950s by pouring concrete into molds. In the 1980s I remember joining my grandparents as they visited their friend, Mr. Heiner. 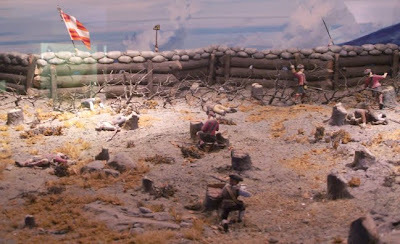 His father was from Germany, and he had created an extensive backyard scene with little gnomes digging, fishing, moving earth, etc. There were even diminutive doorways set into the roots of the trees. It was very magical to a kid. 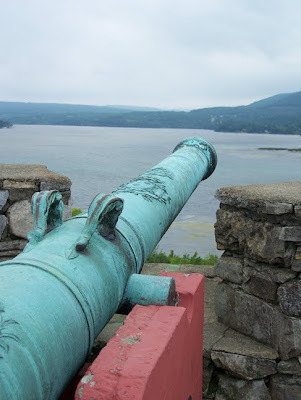 When vacationing on Lake George, NY we would motor up the lake to see "Gnome Island." This was actually someone's rock-covered backyard, projecting into the lake as a shallow peninsula. 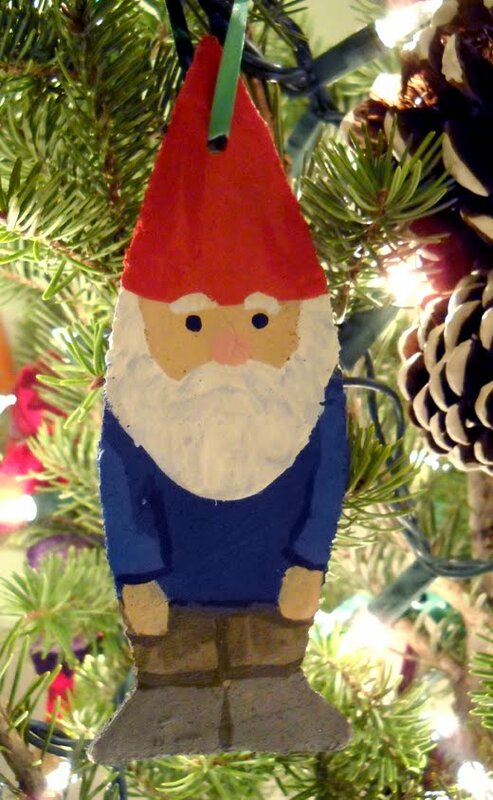 There were always a cluster of garden gnomes there. Sometimes they were r-arranged from the last time we saw them. My dad told us kids that they were the real thing, standing still to trick us. I bought this book for my mom's Christmas present this year. I'm thinking I should get myself a copy—and maybe a gnome for the front yard too. I finished a couple tree stands this week. 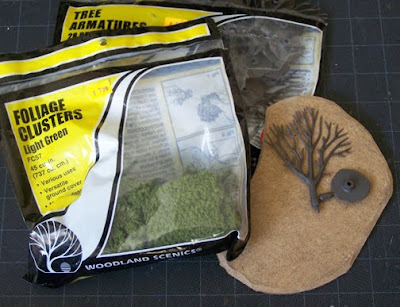 I used Woodland Scenics tree armatures mounted on hardboard. I scattered used dried loose leaf tea (Irish Breakfast) to represent leaf litter. The leaf bits tend to flake off, so I sprayed the boards with matte varnish. A close up of my Black Tree Design woodsmen and leaf litter. 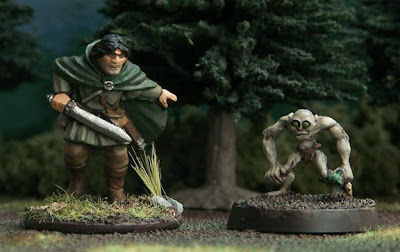 These two are from their "Good People of the Land" sets I and II. The trees have a peg that fits into the root base. 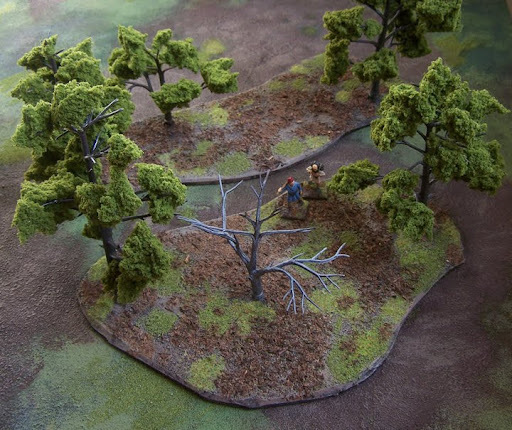 The plastic base is glued to the board, but the trees just rest in the hole. This allows them to be removed if need be (although it does leave a stump in the way). For more tree-building articles see Iron Mitten and Cursed Treasures. Although I have read that North American wolves are thought to be more aggressive than European wolves, this passage doesn't speak very well for the mastiff! I presume the majority of people choosing to read about King Philip's War (1675–76) do so out of an interest in local history. As evidence of this, the authors on this conflict appear to all be New Englanders. My schooling in Pennsylvania completely skipped the subject. 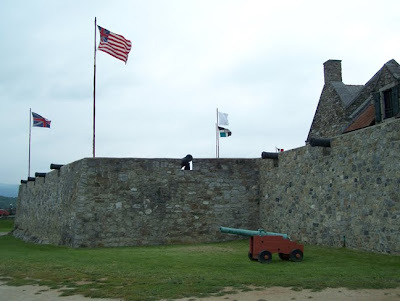 We were taught about the landing of the Pilgrims (one generation before King Philip's War), then we jumped ahead 150 years to the American Revolution. I wonder if school kids in New England learn anything about it—I suspect not. It rather spoils our fond Thanksgiving story. I, of course, knew relations between the Colonists and Indians eventually deteriorated, but I was surprised at how sudden the two groups went from guarded tolerance to mass bloodshed. As soon as the first generation of English became established in the New World, their land-hungry children set about killing off the native inhabitants. Eric Schultz's King Philip's War is a fine book to start your research. Back to the whole regional interest thing: To get a copy of this book I had to make a request through interlibrary loan. The nearest available copy came from a library in New York. That's right next to New England, but 400 miles away from me! The text is divided into three parts. Part I sets the scene with events leading up to the conflict, then gives a chronological general history of the war. The middle bit, Part II, offers greater detail on each of the ambushes, battles, and incidences. This section moves from location to location using modern landmarks to aid the reader. I am completely unfamiliar with the area, so this organizational format wasn't so helpful. To use this section I picked an event first and then used the book's index to find the right page. Part III offers first person narratives of the war. Benjamin Church lead a company of rangers. He wrote of the surprise attack on an Indian town known as the Great Swamp Fight. Mary Rowlandson gave an account of her capture by Indians. The author picks out only a few of her passages. There are several editions of her journal, which I intend to read next. 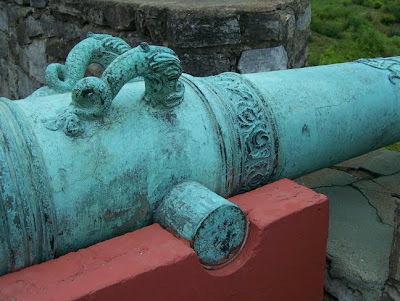 Finally, Captain Thomas Wheeler provides a harrowing account an Indian ambush, the escape of the few survivors, and the Indian siege of the town to which they had retreated. What I would like to find is a book that clearly sets out the combatants. 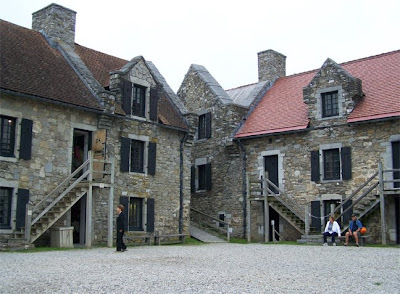 Numerous English and Indian personalities are mentioned in this text, but there is no list describing the people each man represented: Massachusetts Bay Colony, Plymouth Colony, Connecticut, Narragansett, Pokanoket, etc. I'd also like a break-down of the various leaders: colony governors, generals, chiefs. Maybe that's a chart I should draw-up myself! Puritan women from Colonial Living, by Edwin Tunnis. 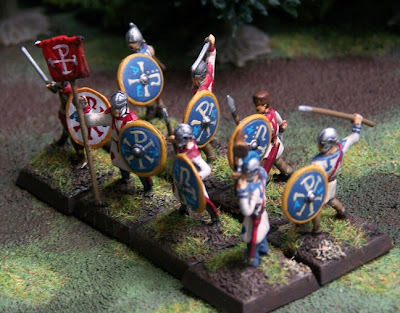 An idea for a 28mm skirmish using Song of Blades and Heroes occurred to me this evening. 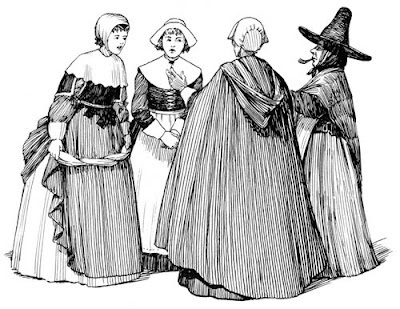 I was reading about 17th century New England and noticed how the appearance of the classic Halloween witch is based on the costume of Puritan women. The origin is obvious to me now (Salem witch trials), but I just never thought about it before! Halloween is in just 29 days. Wouldn't it be nice to post a battle report on this theme? So! Here's the plan: A year after the end of King Phillip's War, word comes of strange goings on in one of the abandon towns destroyed by the Indians. A witch is up to some kind of unnatural mischief, and a team of rangers is sent to investigate. 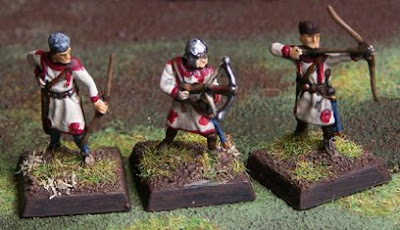 I already have a set of King Philip's War Pilgrim militia from Brigade Games. I was going to paint the Indians this month, but I'll just start on these Puritans first. I glued them to their bases tonight. 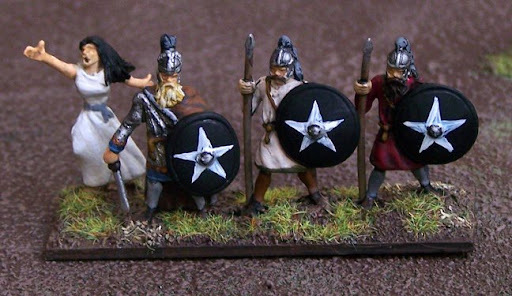 Accompanying these five Englishmen will be a loyal mastiff, courtesy of Vendel Miniatures. 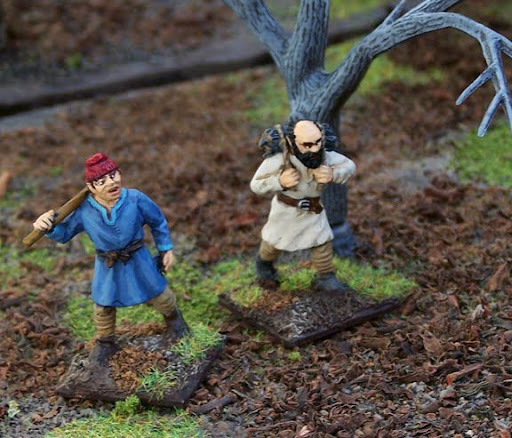 Human Witch Hunter (the guy in the bandana), 50 pts. 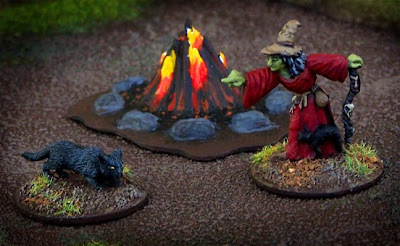 I have a witch produced my Mega Miniatures (now out of business). I wasn't too interested in this model when I bought it. 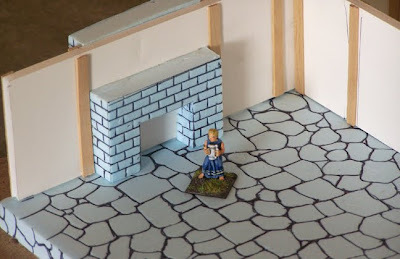 It simply came along with their townsfolk set. I'm glad I have it now. 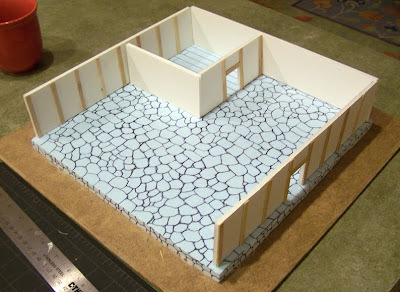 It just goes to show how you might develop a future interest in your unwanted models. 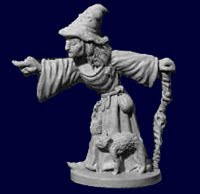 I'm using the Lich from the SBH Undead roster to represent the witch, 86pts. I think I'll keep the rest of the bad side a secret for now. All will be revealed when the models are painted. I know—the suspense is killing you. Will I be able to paint everything before the 31st? Will I photograph everything in time? Will I be distracted by another project, dropping this one all together? Stay tuned! Incidentally, the book I am reading is Colonial Living, by Edwin Tunnis. 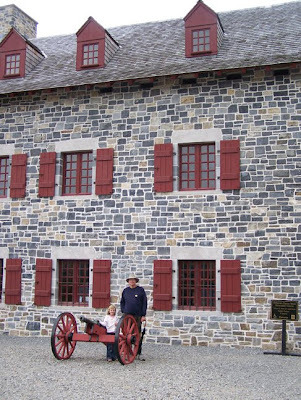 The book is a brilliant introduction to Colonial America. My copy is a hardcover from 1957, but Johns Hopkins U. Press reprinted Tunnis' books in 1999. Ink drawings appear on every page. I'll have to do a proper book review soon. Every summer I visited my family's cabin in the Adirondack mountains. I would spend several weeks there, walking through dense forest trails, and canoeing/boating on mountain lakes. The woods also bordered my house in Pennsylvania. My friends and I would often wander along paths and streams, surrounded by birds, rabbits, and often deer. Perhaps this partly explain why I have a fascination for the people who lived there before the arrival of Europeans. My dad is a big FIW / AWI history buff, so that is certainly the other root of my interest in the woodland Indians. 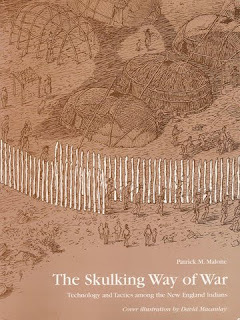 The Skulking Way of War: Technology and Tactics among the New England Indians came to my attention shortly after the paperback was published in 2000. I paged through it quickly and set it down again. 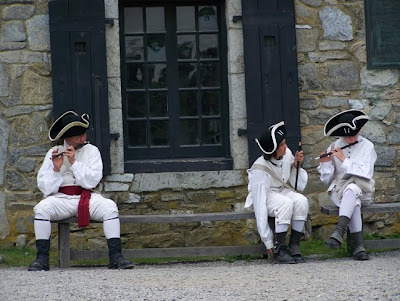 I was reading on the French and Indian War, but 17th century New England held no interest for me. I should have kept reading! I got the book on Friday, and just finished reading in jut a few days. Although focused on King Phillip's War, this scholarly and approachable text can also aid in the study of woodland Indian military actions of the 18th century: French and Indian War, Pontiac's Rebellion, and the American War of Independence. As the author puts it: "In studying the tribes of southern New England, a scholar must sometimes draw inferences from known practices of other tribes." For a general history of King Phillips War, one must look elsewhere. Much like the content of one of Osprey Publishing's Men at Arms* titles, Malone's book is concerned with details of the Indians' and Puritan's respective military systems, logistics, tactics and weapons technology. Attention is paid to the fusion of these two traditions: the Indians were very quick to employ European's latest weapons and the European's will to completely destroy the enemy. The English, on the other hand, were very reluctant to apply Indian fighting methods and long suffered for it. In the end, the American colonists acquired a great appreciation for the Indians' "skulking way" of forest warfare. 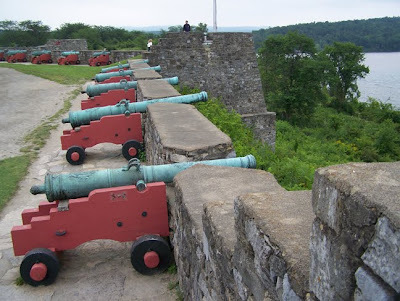 Their use of high mobility, stealth, surprise, and individual marksmanship would serve them well in their future wars against other Indian tribes, the French, and the British. *I should note that the text does not include full color illustrations like an Osprey Book. My comparison applies only to the detailed subject and the concise, well-organized writing. The book does feature many charming contemporary engravings. For a book on the 17th century colonist's side of the conflict, see my review for A Rabble in Arms, by Kyle Zelner. 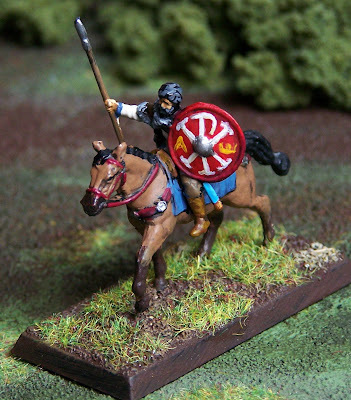 Check out other book reviews and painted miniatures for King Philip's War. 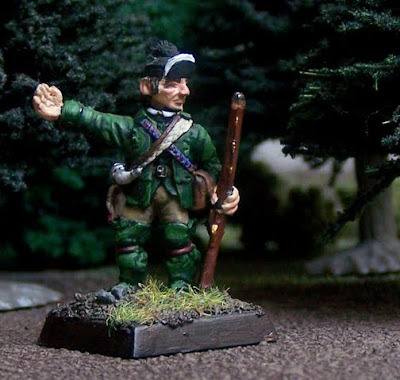 With a fresh interest in the French and Indian War I have been browsing various mini manufacturers, planing my purchase of some 28mm Roger's Rangers, French, and woodland Indians. 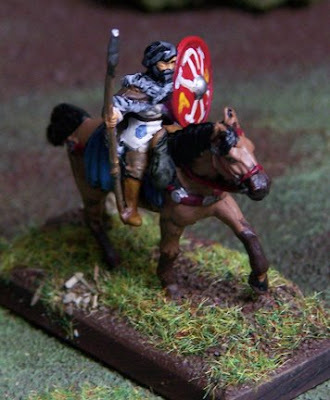 A few days ago on TMP someone asked for 28mm AWI Indian model suggestions. To my surprise I saw a reply describing native minis for 17th century America. 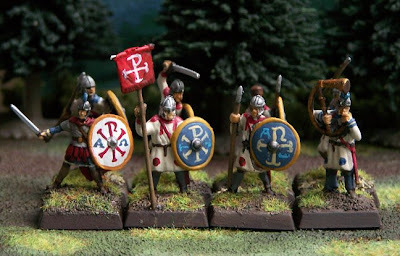 The King Philip's War miniatures were released by Brigade Games in '08. I had no idea that they existed! 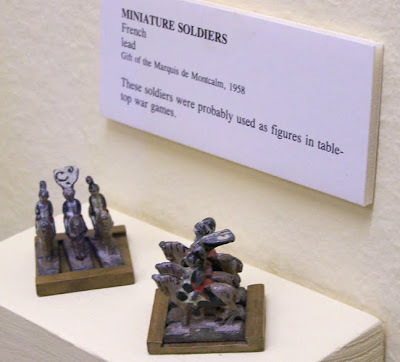 These brilliant sculpts have inspired me to delve into this unfamiliar conflict and time period. To better aquaint myself I have already started reading Kyle Zelner's book, A Rabble in Arms: Massachusetts Towns and Militiamen during King Philip’s War on Google Books. My library should be able to get me a copy through interlibrary loan. I have long been interested in The Skulking Way of War: Technology and Tactics Among the New England Indians, by Patrick Malone. So, I went ahead and ordered a copy off amazon. I'm sure I'll read more, but these two books seem like a good introduction to both sides of this conflict. This evening I just bought their first four packs plus King Philip using my birthday funds. 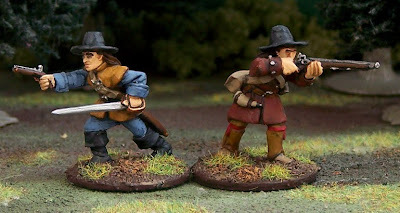 With only 11 Indians and 10 English Militia, I should have no problem painting them all in a reasonable amount of time (once I'm through being swamped with work). With fall approaching and thoughts stretching to Thanksgiving (you know... Puritans and Indians) it seems an appropriate time to get into this new genre.